It’s time to publish the statistics derived from the cyber attacks timelines of April (part I and part II). As always, let’s start from the Daily Trend of Attacks chart, which shows a clear increase in the number of events in the second half of the month. Cyber Crime ranks steadily on top of the Motivations Behind Attacks, increasingly its percentage to 80.8% from 76.5% in March. Cyber Espionage slides to 11.1% from 19.4%. For the first time in 2018, hacktivism takes over cyber warfare. The events mostly in Italy lead its percentage to 5.1 from 1%. Cyber warfare closes the chart with 3% confirming the same value of April. Malware is stable on top of the Attack Vectors chart with 27.3% (it was 39.8% in March). 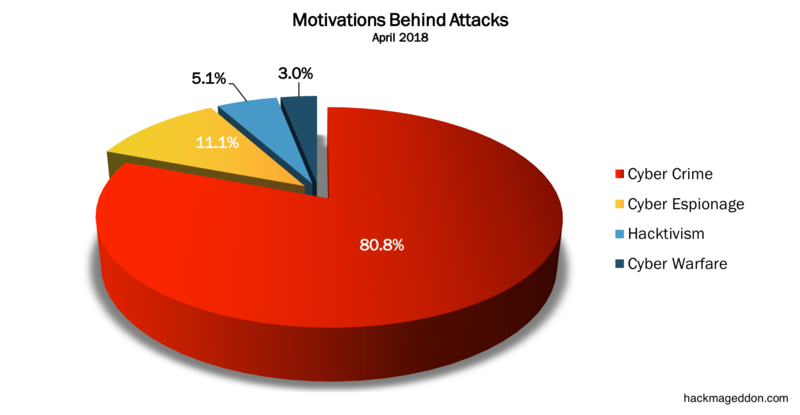 Account Hijackings are also stable at number two with 17.2% (it was 18.4% in March), and, again, targeted attacks confirm their third place with 14.1%. Single Individuals lead the Distribution of Targets also in April with 25.3% (it was 22.4% in March). Similarly to March, multiple targets rank at number two with 18.2% (it was 15.3%), ahead of Public Administration (at the third place in March as well) growing to 15.2% from 11.2%. If you want to have an idea of how fragile our data are inside the cyberspace, have a look at the timelines of the main Cyber Attacks in 2011, 2012, 2013, 2014, 2015, 2016, and 2017 (regularly updated). You may also want to have a look at the Cyber Attack Statistics, and of course follow @paulsparrows on Twitter for the latest updates, and feel free to submit remarkable incidents that in your opinion deserve to be included in the timelines (and charts).